Crafted by second-generation Amish toy makers, Milton and Goose Play Kitchens are made in the USA out of non-toxic and eco-friendly materials, making them not only safe, fun, and educational, but also treasured family heirlooms. It’s no secret that play kitchens are a fantastic way to encourage imaginative play and sharpen your child’s vocabulary, math skills and gross motor skills. Whether they’re learning the names of fruits and vegetables, making up recipes or role-playing with friends, they’re getting crucial cognitive developmental benefits, all while having loads of fun. When we discovered Milton and Goose, we were instantly captured by the beauty of the design and craftsmanship of their play kitchens, but also blown away by their dedication to using high quality woods, water based dyes, and saying no to all toxic materials. Founded in 2017 to provide children and their parents with non-toxic, battery-free and heirloom-quality toys to last generations, Milton and Goose say, “Necessity is the mother of invention,” so who better to invent than a mother in search of a solution? Milton and Goose’s founder, Shari Raymond, was hunting for a play kitchen for her son and couldn’t find anything that met three reasonable requirements: made in the USA, high-quality wood, and a chic, modern design, so she set out to create her own. What started with sketches upon sketches, inspired by real designer kitchens online, in magazines, and in gorgeous homes, Milton and Goose collaborated with toy designers, educators, parents, and of course, tons of kids, to shape the ultimate play kitchen. They interviewed dozens of manufacturers to find the right fit before teaming up with talented second-generation Amish toymakers in Lancaster, Pennsylvania in their family-owned facility. Their unique, Amish manufacturing facility remains mostly off the grid and aims to minimize waste. They source what they can locally to keep their footprint small and their business stateside. This also allows Milton and Goose to oversee every aspect of manufacturing, for tighter quality control, assurance of fair working conditions, and the ability to deliver a superb product to customers each and every time. After months of sourcing the best materials from solid woods and sturdy hinges to the highest quality magnetic chalkboard available, they sent there first prototype through rigorous testing by an independent third-party, CPSC-approved safety lab to make sure they met or exceeded the highest federal safety standards. With safety being a top priority for Milton and Goose, they continue to go to great lengths to keep their products free of toxic chemicals by only using water-based paints and finishes that are isocyanate-free, phosphate-free, formaldehyde-free, phthalate-free, and lead-free. Every play kitchen is also plastic, MDF, and particle board FREE. Because the air your child breaths is just as important, the paints and finishes have been extensively tested to meet stringent emissions standards for indoor air quality, and are HAPs-free, which means they are free of hazardous air pollutants (HAPs) known to be harmful to humans. Additionally, their play kitchens have been rigorously tested by a CPSC-approved third-party safety lab for lead, heavy metals, and to comply with California’s stringent Prop 65 requirement. 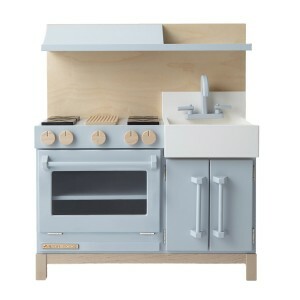 With Milton and Goose, you can be confident that your child’s play kitchen will never require batteries and add more than beauty and charm to your family’s playroom or nursery. Its minimalist design will enrich your tot’s life and provide endless hours of educational fun, while being kind to the environment and your family’s health. It’s really quite simple – Milton and Goose play kitchens are built to last, from day-to-day, sibling-to-sibling, and generation-to-generation.